There has been no signal detected from the surface of Mars on Friday that would indicate the UK-built Beagle 2 lander got down safely. The US orbiter Mars Odyssey flew over the assumed landing zone just after 1800 GMT but heard no transmission. The giant radio telescope at Jodrell Bank in northwest England also failed to make contact after listening to the planet for hours on Friday evening. Scientists refuse to give up hope and will continue to scan Mars for a call. Team leader Professor Colin Pillinger said he had faith Beagle had landed safely, adding: "We will hang on testing and waiting." Both Odyssey and Jodrell will continue their sweep in the coming days. Other radio telescopes including one at Stanford in California and the Westerbork radio telescope array in the Netherlands have offered to help in the search. If Beagle 2 is alive it will transmit at a frequency of 401.56 MHz. Long-term, the Mars Express (Beagle's mothership, which carried it into space and set it loose about a week ago) should be in position to try to make contact with its "baby" on 4 January. Mother and child were designed to talk to each other and a communication with Mars Express may be the best hope. "We're still early days in extra time," said Professor Pillinger. If it had landed safely, Beagle was designed to survive on its automated systems for weeks, if not months, he said. "So we're not concerned about not being able to contact it. "If we can contact it, we can pull this thing round. But it's very much like... sending somebody a love letter. You know they've got it and you're waiting for their response." Scientists say there are a number of possible explanations for Beagle's failure to call home. 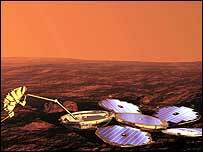 Perhaps the most likely is that Beagle 2 landed off course, in an area where communication with Mars Odyssey is difficult, if not impossible. Another possibility is that the transmission from the lander's antenna is blocked from reaching Mars Odyssey or the ground-based telescopes. Beagle 2 was targeted to land in a large lowland basin called Isidis Planitia at 0254 GMT on 25 December. The "pocket watch" design of Beagle 2 ensured that it would turn upright irrespective of which way up the little lander fell. Soon after, the onboard computer was expected to send commands to release the clamp band, open the lid and begin transmission. The next vital stage was to deploy the four, petal-like solar panels and initiate charging of the batteries. When the Sun set below the Martian horizon a few hours later, the lander was scheduled to go into hibernation so that it could survive the subzero night-time temperatures. Professor Pillinger suggested there could be a problem with the clock which switches the Beagle 2 transmitter on and off - so the researchers could have been listening for a signal at the wrong time. "If the clock is telling it something wrong, and the clock gets reset because there was a computer glitch, then the clock could be completely confusing us," he said. BBC science correspondent David Shukman said that although the scientists were publicly upbeat, among themselves the mood was less cheerful about the "terrible information vacuum". "Generally behind the scenes the mood is getting a little grimmer day by day... the longer this goes on, the worse things look," he said. But Dave Rowntree of the rock band Blur, who wrote the nine-note signal meant to be transmitted from Beagle, said it was too early to give up hope. He told BBC News Online: "The real attempt involves the Mars Express Orbiter which has got specific equipment to look for Beagle." Mars Express has already begun orbiting around the Red Planet, and scientists say it appears to be in a good condition. Its orbit must now be refined so it can take up its science mission - and make contact with Beagle if it truly is operational. Mars Express is the major part of the European mission - Beagle was a late add-on - and will search for water, ice and key chemicals buried under the Martian surface. It has a powerful camera system which could in early January, if all else fails, search the planet for signs of Beagle's parachutes and airbags.